The senior years can be used as an opportunity to pass down fun memories and holiday traditions to a younger generation. There’s a good chance your elderly loved one has fond memories of celebrating Easter as a child, which makes it the perfect time to celebrate the holiday with grandchildren. The senior care experts at Harrisburg Home Care Assistance recommend these activities for your loved one and his or her grandkids to enjoy together this year. It’s fun to get children together with their grandparents to dye eggs. Purchase a few different egg-dyeing kits, get a couple dozen eggs, and let your loved one and the grandkids have a good time. This activity is perfect for seniors who need to sit down for activities and it should keep children occupied and happy. Be sure to prepare the workspace with old newspapers and have cloths handy for cleaning up messes. No Easter celebration would be complete without a family egg hunt. 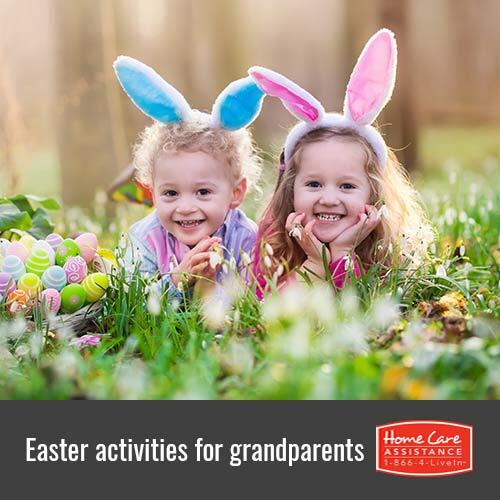 If your loved one has limited mobility and isn’t able to hide eggs, he or she can still enjoy watching the grandchildren hunt for them and can give input on hiding places. If the weather isn’t suitable for an outdoor hunt, you can always have an indoor egg hunt, which also works well if your loved one isn’t physically active enough to spend a long time outside. There are many classic games that can help your loved one relive some of his or her favorite Easter celebrations. Having an egg and spoon race or Easter egg rolling contest can be fun for the grandkids and allow your loved one to reminisce about the games he or she may have played as a child. Get together some small Easter-themed toys, chocolate bunnies, and other holiday treats for your loved one and the grandchildren to make baskets together. Once the baskets are completed, they can be given to friends or other family members or even donated to children in need. This can be a great opportunity to share an Easter basket with a child who might not otherwise receive one. Your loved one will appreciate sharing the act of giving with his or her grandchildren and everyone will enjoy putting the baskets together. Whether it’s on a holiday or any other day of the year, some seniors need frequent socialization to prevent feelings of isolation and depression. Consider hiring a part-time caregiver to provide social stimulation for your loved one for even a few hours a week. At Home Care Assistance, we also offer live-in care and specialized Alzheimer’s, Parkinson’s, and post-stroke care for Harrisburg seniors who need more comprehensive care. To learn more and to schedule a no-obligation consultation with one of our friendly Care Managers, call (717) 540-4663 today.